They’re also delicious and super easy to prepare. 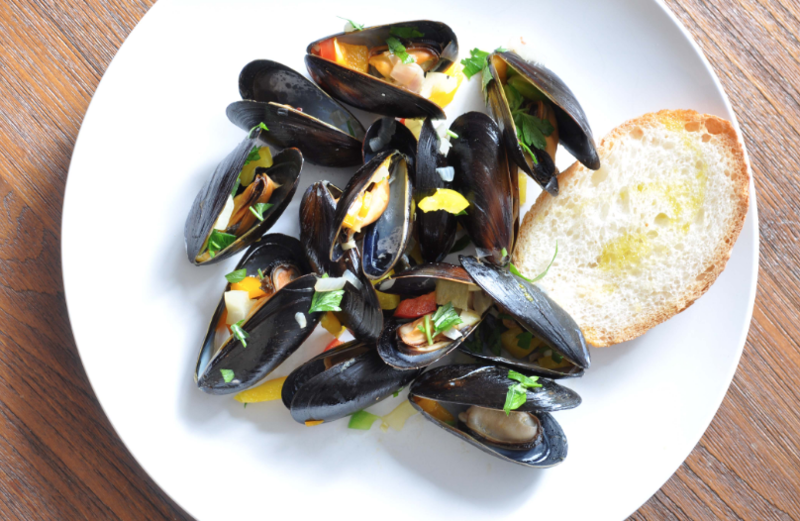 Don’t be intimidated by mussels! Start with this popular recipe from our Teen Battle Chef program! 1. RINSE the mussels under running water, and CHECK for the “barb” or stringing ends coming out of the closed mussel. PULL these firmly, REMOVE, and DISCARD. 2. CHOP the onion finely. 3. Chop the garlic finely. 4. In a large pot, HEAT the olive oil. 5. ADD the chopped onions and garlic, and REDUCE heat to low. COOK for 10 minutes or until soft and translucent. 6. ADD the mussels, and INCREASE the heat to medium high. 7. ADD the wine, and COOK 3 minutes. 8. ADD the chicken broth, and PLACE the lid over the pot. COOK for 6-8 minutes, or until all the shells have opened widely. 9. While the mussels are cooking, SLICE the fennel. 10. REMOVE the leaves from the parsley sprigs, and CHOP the leaves. 11. When the mussels are done, ADD the seasonings and the sliced fennel then CLOSE the lid. COOK for 3 minutes. 12. Now, DRAIN the liquid into a small saucepan. 13. HEAT the liquid in the saucepan, and ADD 3 T butter (optional). REDUCE heat to two thirds. 14. SERVE the mussels over the hot pasta, and POUR the thickened sauce over the top.